Johnny R's review (This content has been automatically translated from French)" I love it!" Made in China, like all Epiphone. Channel 60's profile, rather like that of Gibson. 22 frets, 2 humbuckers, 2 volume, 2 tone, 3-position selector 1. The neck is perfect for my taste, it was really good in hand ..... it can be tiring to start for beginners. The interface is identical in all respects to the "real" and access to acute .... not the best in the world, but it is a Les Paul. We easily get the sound you want, even if the microphones are improved. Note that it has a weight, which can surprise me in the beginning .... it does not bother me, on the contrary, at least we feel we have something "clumsy" in the hands! The bridge pickup is my favorite, the handle a little less because it quickly becomes messy, especially with gain ..... ultimately microphones are average, but not to throw the dice the first few minutes! for the price it is very correct, if you take the time to adjust the guitar. It is true they are quite neutral, without a great personality, for they have against an output level enough balèze. I honestly do not have specific criticisms of this guitar ..... the look and finish are beautiful, the sounds are quite decent at first, the violin is very good ..... the volume knobs work well and are not "ON / OFF", those tone a bit less, but it will. The Grover tuners are excellent, it does not move one bit what happens. The value for money is EXCELLENT: at present, it is less than 300 euros on some sites, and frankly, at this price, I do not see anything requiring more .... must well set at the start: curvature of the handle, action, intonation, pitch microphones, and it sounds! Then, for less than 100 euros, you can mount GFS pickups (including the price / quality ratio is stunning) and there for not even 400 euros was a guitar that has not much to envy her big sister ..... the pickiest can possibly change the knobs and optimize a little wiring, and there it will be really perfect home perfect! Several times I asked myself if I was not going to sell to try to find better, but in this price range, I have not found, for me it is THE quintessential Les Paul copy ..... logic, it is now "branded" official Gibson. With experience, you do again this choice? EYES CLOSED! ttinger's review (This content has been automatically translated from French)" Very good quality, bought in the U.S., never had any problems with it." Made in the USA, lack lacquered base gibson pickups. Channel and violin really well, pleasant to play part in the treble (like all lespaul) and is quite heavy. Microphones without proper basis so its a fairly flat after this depends also on the amp. The tuners are plastic (one I farted between fingers after 8 years) so I put grover is much better. Me I added a DiMarzio Fred and DiMarzio PAF PRO c nickel for everything that is rock / metal all with head ENGL SCREAMER. Powerful bass and clean, sharp lens but do not break the ears. You can make the big rhythm and arpeggio, it's versatile. I've had ten years, after changing the pickups and mechanical (2 weaknesses in my opinion), it approaches a gibson for a price much more interesting. I put good after the changes made, otherwise good / good in the original purchase. - Mahogany body, lighter than that of the Lespaul, I prefer the Gibson with no varnish thus leaves or wood and stroke the wood. - Table flamm maple any beauty Gibson has no maple table at all. - 2 Humbucker Alnico very good quality they sound less dry than 490 of the Gibson Faded. Both say right away if you hsiter Gibson Les Paul faded between 700 euros and Epiphone, Epiphone take, the finish is much better and the Grover mcaniques better quality of the Kluxon. I sidr by the quality of this guitar compared eg Prs Santana SE. Compared Gibson USA, the Chinese manufacturing helps to provide more for less chre. I bought this guitar mainly for its sleeve. I love my Gibson Les Paul faded but his neck is too wide and thick to play quickly, the key is more bad quality. The handle of the piphone is round and less thick, much faster and the key is of much better quality has sees the naked eye. The ergonomics are very good, the guitar is slightly lighter than the Gibson, if not the form we like it or not like it, I love it. We immediately get a good sound. I read reviews that say we need to change the pickups, I not rpons. Really not worth it. Compared Gibson, the sound is even better, less dry, more fat on the neck and just as sharp in acute microphones. It's the sound you love, bold, warm and full on the neck pickup. I do not see the advantage to mount a 59 Duncan will be certainly more prcis but will not have the Gibson grain. Compared Gibson, I prefer the neck pickup of piphone. In clean you can play blues, jazz. The bridge pickup is a bit less powerful than the Gibson but really you have to play for hours to realize it. In any case, it is better than Santana Prs Se. This Epiphone presents a sound less modern than the Gibson, it is better for the blues / rock, hard / blues but play metal, Take the Gibson. The sound is drier, more modern law. Very frankly I will sell the Gibson Faded because aside from the fact that there are marked Gibson on his head, it is well below the Epiphone in comfort. For Epiphone sounds made many Interim progress I remember the old Epiphone factory in Korea whose sound was almost deaf. So do not believe the guys who sell Epiphone Core or Japan by saying that it sounds better than new. That is completely wrong! Epiphone is widely at the Gibson Faded especially well above the old Toka I have 25 years of experience ... If you really want the sound pure and hard Gibson, take the standard 2000 euros, I had a studio which was still worse than the faded. I put 10/10 Epiphone this knowing that I do not know if it's a standard or standard addition. A truly amazing guitar! An audience will not make the difference with a standard Gibson, I think the guys who change the pickups a bit to do anything because the pickups are really very good. - Channel D trs varnish enjoyable, pais (I love), APRS is like it or not. - Accs difficult to acute (it's a Les Paul), especially beginners, APRS used to it. - The weight I have no problem, at least you can feel the prsence the guitar! And gives an impression of strength. - This gives the sound you want easily. - I play a little bit of everything (Hard rock, Blues, Varita Mtal, Punk ...) and it sounds much astonishment! She's really versatile. - I play at home on a Marshall and 15CDR rpt 'on a Fender FM65R, we immediately see the diffrence in sound! His desire saturated on the first and prcis clear and warm on the Fender. Can I also use a Cry Baby, able now! - I have a weakness for his sharp sound in the treble, the sound perfect for bold style Santana solos (but blah for the rhythm), clear sound impeccable, round, warm and prcis. I have changed in recent months amp (a Line 6 Spider Valve 112 lamp), which replaced my Fender FM65R and did not see anything! The real grain of the guitar compltement spring. Since the amp mule several major brands, we can have a glimpse of all the possible sounds of the instrument. The old Fender Deluxe 50's, to Vox AC30 and Marshall, and ending on the Mesa Boogie, and it provides good! J'apprhendais dernire especially this brand for its incredible distortions, where it is necessary to ensure the microphones. No problem, even the drive back. So I add "can do aisment of Metal". 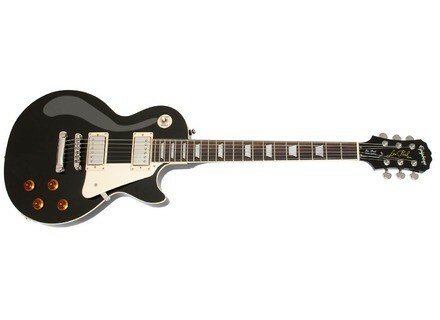 - I like its shape, its versatility, but not worth a Gibson, even if it is close trs! - I bought it on the internet for the price lower than shop, but I have not tried other models before it was acquired. - Trs qualitprix good value, has made all of good quality stringed guitar legendary, drisoire price (409 for me ).... what more? WARNING: This opinion is a post from a guitar modified, as previously said. I had plenty of time to get used to this round, rather large, round, it holds well in hand. this guitar is heavy, but it gives a feeling IMHO fat, body, brief power somehow not unpleasant. "Gets it easy to sound good ?..." ? ah ben ca, yes! regalges good on the amp, and go! The charge, (we must put one!) Is access to acute. not very original, ok, but vridique! it beyond the 17th box, the solos, you forget. I still wonder how guys like Rhoads, Slash or stuck Frehley plans such as high ... Finally, brief ... voila. My style of music, it was more Led Zeppelin, Free, Rolling Stones, Aerosmith (well, almost everything has cheuveux long and a Les Paul) at the time of purchase about 3 years ago. This evolved into heavier stuff like Iron Maiden, WASP, Ratt, KISS, etc ... and has been very little follow-up. Pure tones to bluesy metal, it follows without fail. CMOP serious tone knob to zero, Slash mean to sound "November Rain". Micro Treble, a background tone, the "Phantom of the Opera" picks you up, mouahaha! Joking aside, we start from these two extremes, and we want what is between. I use it for almost 3 years now. This was my first guitar, I knew nothing, and the simple fact that it looks exactly like water that has convinced me of Jimmy Page. What a look! this guitar has a sacred class. The look is superb and the sound too. I have made changes to this guitar by a luthier 250 euros, a sum that included two Seymour Duncan pickups, rewiring the jack, the knobs and a graphite nut. The guitar I own so I am back to 650 euros in the end. expensive? in absolute terms, yes, but a much lower cost than a Gibson anyway, and once epiphone change is a comparison without any problem. I take off point for the two knobs, which, in my opinion, are almost useless (the settings are made on the receiver rather than on the guitar). But do not leave, it is very well anyway! Channel pleasant? YES, for me it is a "highway". Easy access to acute? NO, but it is a Les Paul, not specially adapted to the frenzied solos to the last frets. Do you get a good sound easy? All depends on what research, but for the big sound, this is where it happens! Led Zep fans, Paul Personne, asdèce and other metalheads of all kinds, you have been warned! I use this with a Les Paul Line 6 "Spider Jam", and believe me, it sends, but serious!! I played before (5 months ago on a marshall, the AC was good too). Its clean, it is also very nice (to try heads of ways, on your amp + ieurs mgsin preferred). With a slight delay + reverb, micro pos. Central, it is close to the sound of "Satch" intro song "Circles" or the last track on the album "Crystal Planet" of the same Satriani. (I forget the title !!!?). My favorite remains the course, the well saturated, fat, its where this guitar is made !!!!! In conclusion, I use this guitar for 2 years now, and what I like +, you'll understand that it is made to sound loud and full. playing guitar (with a minimum of serious, given the investment: 500 euros 2 years ago), and what you want to request a scratch guitar that is not afraid of distorted sounds, it's a Les Paul you! In hindsight, it is clear that the choice I would do, I do the same earlier! to have a larger palette of sounds. So use it depends on taste, if you love heavy guitar (that is my case = P) and you like big round asser (lespaul therefore normal) it should please you. At the game, I find the handle very comfortable, I have to try lots of other type of guitar (Ibanez RG, Fender Tele, Ltd., Dean, etc ...) and I didn 't find this on any other comfort guitar = D.
The access to acute is (that is not a Les Paul Flying V nonplus) ca me but I completely agree! Then frankly I have been surprised when I have received! "I had heard that the pickups Epiphone n 'was pretty bad and it was better to change faster, but the impression that I have had that is that they are microrespectable! It is on that are going on everywhere, but not own personality that is very convenient! Even if that is true, what a personality all its own that makes it better in blueus style, and rock and roll but I find it particularly versatile! I plugged into a Hughes And Kettner Matric Combo 100w and I arrive to have a rich sound palette After it is sufficient to have the correct settings. The quality / price ratio is really good I think! Throw away your on it if you like the myth Lespaul!! Ultimately I would metterai 9 / 10 because nothing is perfect, but it must be with Seymour 's approach it! Well, I&#39;ll do a review of espce dtail, even be too long and boring, and repeating what has t crit before. Epi Les Paul flame top standard in 1993 (among Premire, I think) made in Korea. Purchased new. And finally, micro sheet drable flame on the table, just for the visual. No te vritable table (!) In Rabl (!). >>>> Horrific APRS installation of microphones and Verify &#39;, there is indeed a thickness of 1.5 cm 2 of a saddle and Saddle Famm sheet. Channel two parties reports, super thin, flat (type jackson! Another surprise) that begin with 22 frets quite admit their age. The pickups are original (not for long). I changed the tailpiece and the bridge home for a couple Gotoh transmitting much vibration. The tailpiece dorigine Stait us to quickly gorge crossing ropes and under the right hand (!!!). The nut is bone (+ rsons too). Mcaniques of origin (always stable, surprisingly, still a good surprise). Jattendais of limprcision for change and are always l. But other fats of time. I put 9.5 for configuration, instrument making (manufacturing plutt) treats and without default (not like a lot of Gibson!) Not to mention the wear on frets. The handle is a real track game until the 17-18me fret, APRS is necessary to give a little pain may be too late for the good hands of bcherons, with medium frets -jumbo that do not hang at all (trs another pleasant surprise). It shall not be twisted or even PForm sil is fine and not new. Cest good sign. Access in acute is ... Not easy. But we are prvenu! And we must tame a scraper of this type, it can not be played as a. For the rest it goes "well" in ctes with softened corners just over a real Les Paul (I say &#39;must be tamed). We know! And on mine, the weight is correct for plutt one unit of that kind. Should that lasted seven hours non-stop, even when! Otherwise, hello kin a bit like a Les Paul, what! But we know too! Cest not an Ibanez Sabre. Point. + Bone nut (most standard Gibson no longer have, that the poor plastoc!). + Easel in real metal. + Action a little high (2.5 mm 2 Douzima the box). - Its that sest enhanced and approaches (not compltement) dune real Gibson Les Paul Standard. - Her full, more rich and full vacuum (a rgal yet). - Sustain crazy (a marvel). - Vibrations all around (a tickle). I walk down the note 8.5 to 9, due to the lack daccès acute angular body. Well, pass the point a little critical of the ergonomics relative (o the bevels are?? And the heel affine ??? ), we must talk about the big criticism of this guitar: the microphones, c is not new, it&#39;s not original! This is normal. As I bought it new, just my preference. Then over time, and fiddling with other (better, wonderful) guitars, one s&#39;aperoit weaknesses. The game evolves (and better &#39;is esprer) and the requirements are more sophisticated. In a good amp lights, the microphones most often kindly fill their office, in the light jazz, blues, blues-rock quiet. In crunch, has spent as the saturation lev nest not too blues-rock, rock. But the ds saturax is sturdy, they admit their limitations. As for distos of all kinds, take the time to find the legalization that will make it less runny. Rock and heavy rock: OK. But forget the mtal or thrash edge, has not work. Transistors in an amplifier, may get better but it should not be a bass amp load / medium low. Changes tailpiece, nut-string never catch up to microphones in dire need of clarity or punch or prsence (Oh burstbuckers The pro without cover Gibson! The PAF, SH2-SH4-5-6 Duncan ! The Norton, Tone Zone, super distortion, evolution of Di Marzio!). So a lack of DEFINITIONS, cest rough, soft, tangle. And to make matters worse, with lge, these microphones have lost a little clarity and quil DEFINITIONS had. And power as well. Dmagntisation magnets, rapid aging and low music, or my ear that does not support more? A little everything, I think. Daut, quaprs have got a standard Gibson, a Lag Roxanne, a PRS, it&#39;s more possible to support a! L or can be crmeuse Gibs and a little dirty, rocky, the microphones will be more of my Epi boiled - with songs. It may also be part of the pulling ropes. >>>>>> With stainless steel strings, it&#39;s brighter, but does not help the imprcision. Ben honnte to be, the microphones will cder better place (Duncan SH 2 and 4 or 5) or more extreme (Duncan Disto, Di Marzio Tone Zone?) As so many others have on their Epi. And it will be left with a vengeance! Come on, planning a new small frets, before replacing them in some nearby years, a shield and the tower will be llectro jou. It will be virtually no default! I do not know if for a else would be worth to the transplant while the frets will also change, as the guitar nest longer young, but for me, I dont doubt I want this enough to continue playing Polle, and for the redcouvrir in a new light. Cest Gibson and no one will ever be a nen, but we know too. E This is a little diffrent ft, and for a cest I&#39;ll keep it. It has its qualities, and its default will be partially erased. So what? So for the report qualitprix of this gear, it would lpoque plutt twice quune I Rasht an Epiphone Les Paul Standard (a little less present), even with these microphones. Javais bankrupt even buy a custom 3 pickups a few years ago. The Epi Les Paul today seem worse off in the woods, but much better at the microphones. I prfrerais a scratch with better wood. The pickups can be a change. Short! Résumé to: Has my Premire correct scratches, and it will be one of my prfres. - Access in acute type is ... Les Paul! That - that it will take to twist and well put his thumb to play. Good for the game scne, not good for sweeping or extensions! - It is heavy as a Les Paul any self-respecting ... prvoir a strap with a reinforcement to the shoulder. Can be used as weapons if song! However, it is well balance. - SETTING THE The intonation is not the best person in the world with the tune-o-matic and acute micro! - The height of the microphone is easily adjustable. It is too low to cause acute microphone. I give 8 because of the weight of Access in acute and intonation SETTING THE backwards. But as she perfectly silent RULES (action, intonation, rgularit freight), I give 9! - I play all styles of Blues with a drive head and a Marshall JVM baffle 4 X 12 Celestion Greenback. - We obtain the exact sound of vintage Les Paul. All Led Zeppelin is the! But John McLaughlin Mahavishnu PERIOD PERIOD or Jeff Beck Beck-Ola. Play on an amp lamp is back in time! - Trs good for blues, jazz, rock, hard rock. - This is a guitar for earnings idalie modrment levs (IDAL with a Marshall JCM)! - Mahogany, weight and unique dcoupe gives the micro serious trs sound velvety deep, round, full and warm. Perfect for glisss! - The Saddle vintage gives a sharp sweet-sour, with the micro acute or both, ideal for the style of BB King, Freddie King or Albert King. Even if we get better with a semi-hollow (ES 335) ... Let's say we approach it terribly! Enough in any case to vary the sound in a song. I have for over a year and a half and rpond exactly what I wanted: to have a Les Paul type CHRE not to play with the same constraints and (almost) the sound of many my guitar-heroes of their own songs or their style. Oh, I forgot! For me, finishing in bne is the most beautiful guitar in the world! I think with other mics, I spend the same Gibson!